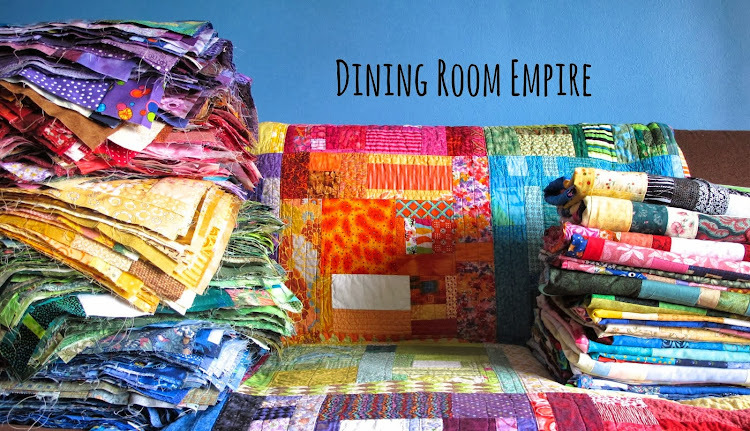 Dining Room Empire: Shades of Grey Giveaway! Okay, two little bits for you today. You may or may not know about either of them. If you do, then consider this more treats. If you don't, then consider yourself informed and treated. First off, let's have a giveaway! 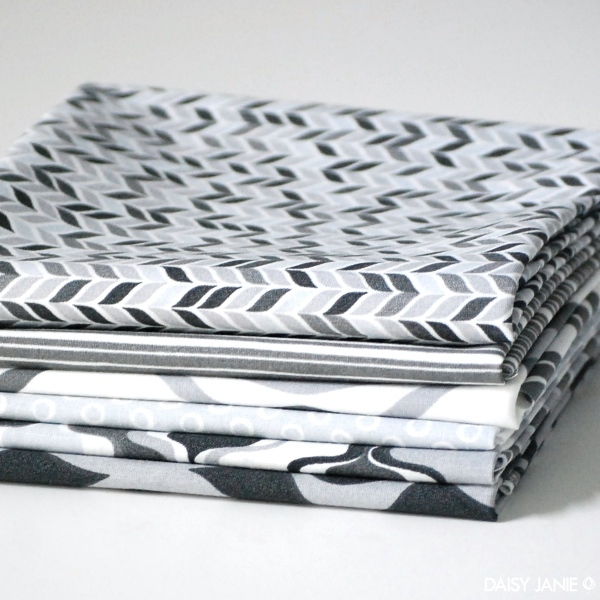 Jan from Daisy Janie is donating a fat quarter bundle of her gorgeous, organic Shades of Grey line to one lucky reader. And I'm contributing a free Kinda Herringbone pattern (PDF to your mailbox) that was completely inspired by Shades of Grey. 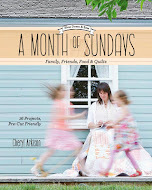 This giveaway is a direct result of Jan and the lovely Cara from Cara Quilts. Have you heard of Talkin' Tuesdays? It is a Twitter chat held on Tuesday nights. (It was that obvious, wasn't it?). Cara hosts and is joined in leading the discussions by the weekly sponsors. Sponsors mean prizes! So, a few weeks ago I won this bundle from Jan when she sponsored Talkin' Tuesday. Seeing as I've made a quilt, and pattern, from Shades of Grey already I talked to Jan and decided to pay it forward. One lucky reader will get the fat quarter bundle and the pattern. Jan and I are curious, what are your thoughts on using grey in your sewing? Do you combine it with other colours? What ones? Have you ever used grey by itself? Or, just tell us about your love for grey. To enter the giveaway just leave a comment on this post between now and Thursday 8 pm MST. I have paired grey with orange and blue. they were the favourite colours of a bride i was giving the quilts to. I love grey and yellow. BUT I did so many quilts like that (using up my grey and yellow stash) that I may have made myself a little sick of it. Whoops! I love grey, you can combine it with everything! I am collecting different shades of grey at the moment to use them with charms from a rainbow swap. This bundle is just perfect. Thanks for the giveaway. I am loving the greys I'm seeing. so far, I've used grey as my neutral on one quilt, but want to use it more often. I don't have much yet, but want to collect it before it's not "in" anymore (although I hope that doesn't happen!) Thanks so much for the giveaway! I've never made a quilt just in grays, but I do have one planned with lavender & gray right now. I have not yet used grey. BUT I love how it looks with bright colors. It really makes the other colors pop. But I love your all shades of gray quilt also... hmmmm. I'd probably use it as a neutral. thanks for the chance. I love using grey with other colours but I love your quilt pattern with this line and I think my husband would love it! I love grey and combine it with orange or I use it as a solid with many different colors. I have not actually used grey a great deal but I love the look of it. Some in my family tend to see the world very black and white, I tend to see a great deal of grey. I reminds me of myself in some ways. I am currently working on a 'Swoon' for my Honeyman using solid Kona grey as background! I love how modern it makes a quilt look! And when you are making a quilt for a man it is sometimes hard to not make it look little boy! 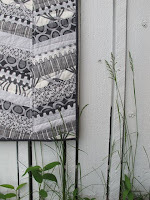 I love the idea of using grey prints all over on a quilt and mixing and matching! These are BEAUTIFUL fabrics! Great giveaway!! I would use hard pink with it. I have not used any grey jet, but I would love to try it so...Thanks for the give away. I've only used solid greys so far in my sewing, but I've paired them with lots of colours. Pink, blue, green - I think grey can go with almost any colour. I'd love to do something with grey and orange! Grey is the new decorating neutral Sometimes white is too fresh and black too 'out there' so I'm thinking grey just may be the way to go. Saw a recent aqua and chartreuse with grey. Drool worthy! I actually have never used gray. But I have seen some wonderful blk/wh and gray/wh quilts and would love to do one. OOOoooooohhhh yes please! I love grey! So much so that it was in our wedding! I'll probably use it with bright blues and sunny yellows! Would love this! I think I would use the greys and bright kiwi greens together. Just to add a little punch. Thanks. Super giveaway! I like gray because it works so well as a neutral. I like greys, and have used them in a number of quilts, often matched with yellow and aqua, but I've also matched them up with Rainbow brights and pastels. They are the perfect match for so many colours. I'm getting quite a stash of greys - can always use more though! Your pattern is a great use of them. Thanks for the opportunity! I love grey! I've mostly used it as a solid, very often a a background neutral. I love the color grey in general, but have yet to use it in a quilt. I really want to use it as a solid for a background, but I had never thought of grey patterned fabric like these. I would love to come up with something! Grey goes with ANY color, but I love it with greens! I love grey as a neutral and in particular pairing it with black, white and another colour. So far that other colour has been pink (bright pink! ), red, and golden-yellow. I would like to try aqua blue or green too. Grey looks great with so many colors. I'm just getting the fabric ready for a king-sized quilt for myself, in greens, grey, and white. I would love to make that Herringbone quilt for my hubby, thanks for the chance! I love gray, and use a lot of it. I've paired it with pretty much any color, but I love using it with greens and blues. I've had a hard time incorporating gray into my quilts. I love color so much that it's been a challenge. However, I've seen so many stunning quilts with it and finally added some gray to the quilt I'm working on right now . . . it's turning out awesome!!! So I'm coming around ;) Thanks for the chance. I love pairing gray/grey with anything! For me, it's the new black. What a great giveaway...thx so much. I haven't used much gray. I have used a lot of black and white prints, they go with everything. I imagine that gray would be the same way. 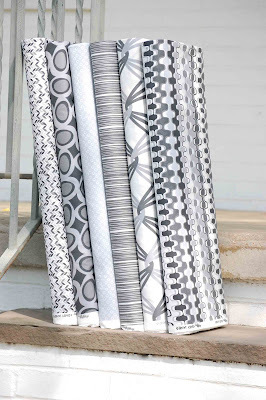 I love these fabrics and the pattern is terrific. Thank you for the give away. I love the thought of using grey by itself or with other colors. I have yet to do it, as my local quilt place does not have much selection. 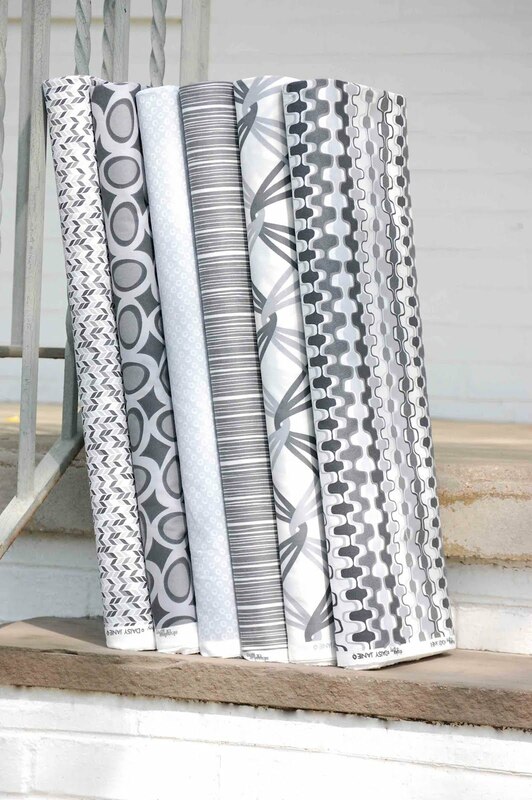 I have a selection of teal+white fabrics that would look great with these shades of grey. Usually, I tend toward brights, but the grey quilt intrigues me. Thanks for sharing your good fortune! I would love to use these grays with some of the great oranges I have been "collecting". Oh my gosh, I'm making a quilt right now using grey and white fabric with small accents of colors in each block. It's going to be very scrappy, so adding more grey and white fabrics like those here would be awesome! i;ve used dark gray a lot with other colors, but pale gray i have a hard time with. beautiful quilt! Lately...I've been thinking grey and my favourite lime green. I'm sure a quilt in these colours would be awesome. My fingers are crossed! Grey - love it. I wear it a lot - most of my dress pants/skirts are grey. So grey in quilting I treat as a neutral - though I tend to use with brights, and often cooler colors. Just putting binding on a baby quilt made with a grey Art Gallery fabric with some of the greeny/yellowy soul blossoms fabric. Grey seems to have taken the place of beige for a lot of quilters. But your quilt is amazing - grey for grey's sake! Thanks for sharing! Recently, I paired some charcoal grey with citron yellow. Loved that pair! I also snagged this bundle that has grey, white, and this tangerine-ish red. Can't wait to cut into it! I have almost no gray in my stash. I only used it one time in a quilt and loved it. When I shop Grays just don't jump out at me to buy them, but I would really like to use them more. I am working on a project combining grey with red & tan, with possible accents in navy or black. I think the colors are bold, but also natural. let's see if I can express that in a quilt..
my favorite is to use grey w/ other colors. thanks for the chance to win! I love the sheer dynamics of grey. It works on its own. It adds marvellous contrast to brights. It enhances other neutrals. It is the exotic cousin that beige wishes it could be. i love it as a neutral with other bright colors! I adore gray. It's become one of my very favorite neutrals to pair with almost any other color. I like whites as well but with two kids and a few pets, gray is a much more practical choice for me. I use it with orange, yellow, pink, red, you name it! Your herringbone quilt is really an eye-opener though, for using gray on its own. Lovely. I honestly have not really used gray. However seeing it being used more and more instead of a white or cream neutral, it has inspired me to ditch the white I have for an argyle quilt and replace it with a gray to go along with the bright pink, blue, green, and purple. Since I tend to have to make things bold and bright, I could see a bright pink, orange, or blue as a border and for quilting to your herringbone quilt to suite my fancy! I have done a beautiful baby quilt using gray as my neutral. The other fabrics were brights. I love it!! I've come to love grey and using it in quilts and other crafts since my sister and I started the blog http://inspiremegrey.blogspot.com. "Grey as the perfect neutral" was her idea, but I've embraced it too and would love to win the bundle and pattern! I don't know that I've done much sewing with gray but I wear grey all of the time and recently painted my living room a combination of slate gray and white. these are beautiful fabrics and I'd love a chance to give them a whirl! I find grey to be a very calming color. I like it in quilts and in my house! Love your pattern. 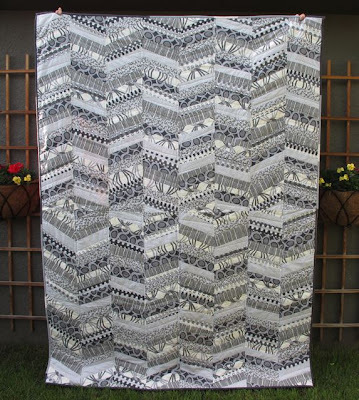 I never thought of doing a quilt in all shades of gray. If I win this, I will! I love grays, and I love these patterns. I have not used them yet but then I've only made three quilt tops so far, and I mostly stick to repurposed or donated fabrics, which limits my selections (not a bad thing at all). I have always used grey with black and grey but lately with I would like to put it with pink. A bright pink!! It would be beautiful. grey is my "go to" color - in my wardrobe and in my sewing/quilting! i love the way a dark grey can make color really pop! i love greys with bright berries, teals, and mustardy yellows! I love grey and use it a lot. I especially like it with orange, pink or blue! I have a deep and abiding love of grey, and yet, I have not been able to put it to use much in my sewing. I'm loving grey and yellow as a combination right now, and hope to eventually make a quilt for our bed from that combo. I'd combine the greys with ecru, yellow and a bright green. Grey is definitely my go-to neutral. I like to pair it with high-contrast bright colors, though I'm currently working on a quilt with grey and purple only. I have been collecting grays- I have the zipper print already! Have used with orange and turquoise. I love grey with yellow. I love gray. Most of my bedding is gray to contrast the bright accent wall in my room. I think its a great neutral color that's very sophisticated! I'm using grey more and more. I love it as a neutral with brights. I especially love it with green and yellow and have a quilt in mind with these colors. I love grey because it's a casual neutral. Coming from Seattle, it's also a very natural color to me (hello grey skies!) and goes well with a pop of color. I made a grey/pink quilt for a friend. Sooooo not my colours. But definitely hers. If I had this I'd team it with a slash of yellow. I've never really used grey before in my quilts - I've always gone for colours. Then again, I never really had the lovely, quality prints like this Shades of Grey range, so maybe I just lacked that inspiration! I had never used grey until a block I was making for a group required the color. Now I wonder what I was thinking...I love it. It's a very rich neutral and it is great by itself. What an awsome giveaway. Thanks. RED, Bold and Beautiful RED! I've used gray in many many quilts, but never by itself! Yours is beautiful. I really love grey, and think it is nearly the perfect complement to so many colors. And your grey quilt is beautiful. I absolutely love gray. I don't use it as much as I would like but have used it a lot in combination with yellows, aquas and pinks. I have used grey, but only in combination with other colors. I would be intrigued to try a shades of grey quilt. I might be tempted to toss in one small pop of color. I love gray. I am doing a nursery in grays and splashes of red. I just made a queen quilt with shaded of grey, teal and yellow. The colors blended so nicely and I love it! Thanks for paying it forward. PS. I find myself using gray and grey interchangeably when I type. Now I just think about it more. I think gray is a lovely neutralizer type of color. The showcased quilt is lovely! I like using gray in two ways: 1) as a neutral, which I've done; or 2) as the color. I just bought 15 yards of Kona Ash, to keep as a basic staple in my sewing stash. <3 <3 <3 grey as a neutral! I have only a little grey in my stash. I would be very tempted to make an all grey quilt, but don't currently have enough. Thanks for the chance to that! I generally use grey with other colours. Pretty much every colour looks great with grey. A current WIP quilt is pairing it with cream, red, green and blue. I really do love your herringbone quilt with all greys though. Grey is one of my favorite neutral colors. It's definitely a color I try to use in all my projects. So Ii do combine it with other colors. I like the way grey makes them pop. It would be a nice change to use grey as the only color in a quilt. Change is good! I love grey with black and maroon. I've also fond of it with shades of blue and green. I love grey - it is a great compliment to colour! So far I've only done a big piece using yellow and grey but I would love to have that bundle so I could try some other things. I love greys! Very often, they are a better neutral than black or white - less intense. I like them in solids and in prints. 18 months ago when I was making the Tokyo Subway Map (Oh Fransson) quilt I couldn't find any - and now there are great ones! Thank you for the giveaway! I'm currently loving grey with yellow! I have used gray with pink and blue in a baby quilt, but I am loving the yellow and gray combos coming from Michael miller. I love gray! I've never used it alone though. Gray is the color that I come to when no other "neutral" quite works out right. I think it can be used in/with everything. Grey and yellow or bright green - just gorgeous together!! I am in trouble at home because I have made quilts for everyone but not yet for my husband. "I'm waiting for the right inspiration" is my mantra because it's true - I want it to be special. I think this grey might just be that inspiration. Masculine and yet the designs are playful and full of energy and fun. I haven't made anything with grey yet but I have a plan in my head and it definitely includes one or two pops of color. I do like quilts with all grey but I enjoy a contrast of a dark slate solid. Thanks for the great giveaway! I haven't used grey yet, but I've loved the different quilts posted on the blogs I read. And so I've started buying some grey fabrics to try one out for myself. Thanks for the giveaway. i adore using gray. i bought a dress last summer at a garage sale that is brown, darker brown, and gray. the dress doesnt look great on me...but the color combo had me hooked! i think gray is a great color in quilts. I love Grey and have been using it in place of white lately. I think it really helps the other colors pop. Thanks for a great giveaway. I've been obsessing over grey for 3 years now :) I started collecting grey fat quarters for an entire grey only quilt but since they are so hard to come by I still don't have enough. These would make a beautiful addition to my grey stash and would be so adored!! Heya. I'm new to using grey. No really, I just bought Kona Coal and am trying to figure out what to do with it. Previously, I used black for shashing and borders. Grey seems to fill that same spot, but without the starkness of the black. It seems softer. So, yeah, grey is WAY out of my comfort zone, but I'm learning to love it! Right now I'm working on a black, grey, and yellow queen-sized quilt. Ahh yes, and I made a doll quilt with bright batiks and grey! I love the combinations of grey and yellow. I love grey and yellow striped/chevron fabric. I have been pairing grey with bright reds and greens and pinks lately - and loving it! I am making a lot (a LOT) of blocks from the Modern Blocks Book (a quilt along on SeamedUP) using Lori Holt's 'Sew Cherry' line and combined with Grey - it's gorgeous! Thanks for the chance to win this great bundle of fabric! Come to think of it, I have never experimented quilting with grey material. But I would rather mix it up with some red or brown. I love grey - it seems to go with everything! It's certainly the 'in' colour at the moment! I probably would use it with some yellow color. However, because of the patterns, these prints look very nice just as they are. They wouls shine on their own! I love gray (yep, that's how I spell it) as a basic. I think I would love to make a quilt using gray and purple together. I love to pair grey with teal and/or pink for baby quilts! Makes the quilt sweet while maintaining a modern edge for baby blankets! How perfect!! I was just admiring some grey fabric this weekend and thinking about how I am really liking the way it is being used som much lately. I really like the yellow, turquoise, grey combination, but also like it paired with red, turquoise and pink. I just really love grey lately! Your quilt looks great by the way! I am allover the herringbone pattern in my scrapbooking lately--would love to make it into a quilt. I am in Love with greys....and I am longing to have the collection you are offering. I use it with citron....and with reds...Can't seem to have enough. Thank you for the chance to win! I love grey & use it a lot, both solid & patterned. I somtimes pair it with bright colours & other times I keep it restrained with just grey & white - either way works for me. Love the quilt and pattern. Gray with eggshell blue is my favorite! I think gray is the new white, lol. I love gray with colour, it makes the colours stand out, it looks modern, and is a bit more practical than white. I haven't used a lot of gray, but I really like how they worked in the quilt in the picture. Thanks for the giveaway! I would love to use grey in a quilt, I think a muted coral would look lovely with these also! I like it as a neutral, especially with bright colors. Such beautiful fabrics! One of the projects I'm going to start next month is an all black/white/gray quilt. I'm usually all about happy, loud colors so I want to try something really different. These grays would be perfect to incorporate in that quilt. I have loved your herringbone quilt from the first moment I saw it. It's what made me fall in love with Shades of Grey! I love gray - it is a staple in my wardrobe - but I have only recently started using it much in quilts. Last fall, I pieced a black/gray/hint of red skull quilt from Boo Davis's Basket Case pattern. I have started collecting gray fabric ever since, and I hope to do more. I have enough gray/yellow fabric to make a quilt, but I cannot decide on a pattern. Winning would be great for my stash!! It took me a while to warm up to grey but I've found that it mixes quite nicely with many colours and doesn't have to be "cold". I don't think I'd want to make an entirely grey quilt but I am planning a grey/red/stone/white quilt right now ... for my son. Something masculine. In fact, I've already grabbed some of the very fabrics for this very quilt. Since I've seen up close and personal what beautiful fabrics they are both in design and touch, I would dearly love some more! I love grey and am brooding over a plan in my head for a grey with turquoise and red quilt. We'll see how that comes out. I love grey but don't use it much. I need to start being more adventuresome with my colors. What a great giveaway. Thanks for chance to win. Love that fabric and your pattern is great. I would love to use more gray in my quilts! I love it matched with pale yellows...or greens. Oh, now you got me started, I'm going to be thinking gray all day! I do love gray. It's a really fun neutral that is great alone or with any color really. I've seen it a lot with yellow lately and I just adore that combination, it's also really fun with red/pink. I've used it a few times in my applique quilts but never alone. 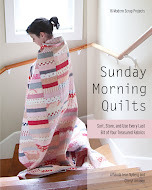 I do love the quilt pattern and if I don't win I may just have to get it anyway! I love grey with aqua and yellow. I am also using grey in a quilt with purple mustard and teal. I usually don't use it by itself, but the quilts you showed are beautiful! I love grey. I have not made a quilt that is just grey but seeing yours is getting my mind churning. I think grey is such a great backdrop for every color. Oh no, it's 8.05pm, can I still play?? I like to add a bright color to make both colors pop!